The authors of KISS ALIVE FOREVER are partnering with PledgeMusic on a pre-order campaign for physical copies of their classic book to celebrate the return of Vinnie Vincent at the 2018 Atlanta KISS Expo. Only 800 copies have been printed with an all-new cover featuring the band’s classic Creatures Of The Night era lineup. This PledgeMusic campaign is expected to sell out very quickly and no additional copies will be produced with the new cover. Out of print for nearly a decade, KISS ALIVE FOREVER has become a highly sought-after collector’s item, with hardcopies regularly fetching $100 - $200. From this limited supply, the authors will also make a handful of autographed copies available to interested fans. 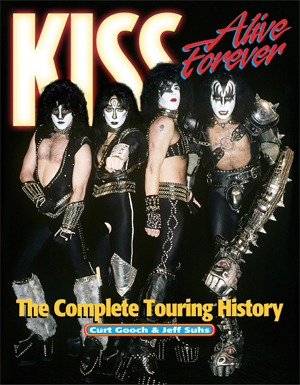 First released to near universal acclaim in 2002, KISS ALIVE FOREVER is a 288-page archive of KISS’s touring history, detailing the band’s concerts by date, venue, opening/headlining acts, attendance figures, setlists and more. Upon publication, the book was immediately adopted by the KISS Army as the benchmark in KISS reference works, a distinction it enjoys to this day. The leaders in direct-to-fan platforms, PledgeMusic allows authors to get more personal with their fans, offering pledgers updates straight from the source and books not available anywhere else. Fans who pre-order their copies of KISS ALIVE FOREVER will have their books shipped on January 5, 2018. This will be followed by the author’s appearing for a Q&A session at the Atlanta KISS Expo on January 20, that will include a 30-minute promotional film showcasing newly discovered, never-before-seen KISS footage from 1975-’83 that will not be screened anywhere else in the world. KISS ALIVE FOREVER is the official book of the Atlanta KISS Expo: www.lakissexpo.com.